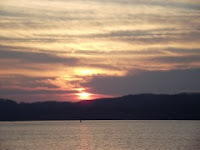 Here are a few photos of Kingston, TN. Hubby and I were driving through the town when we saw this beautiful park. It was the perfect place to get out and stretch our legs! The City of Kingston 58 Landing is an inviting park right that's on the waterfront. You can't help but stop the car when you see it. There's a boat ramp, benches and a paved trail that meanders along the water front. You can buy food for the ducks, fish and geese out of the machines in front of the water. It only costs .25. Please don't bring bread as it can make the animals sick. The towers of the Kingston Fossil Plant are in the distance. 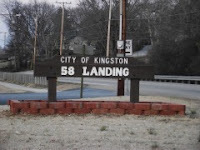 Kingston, is in Roane County, Tennessee and is the home of the Watts Bar Lake. This is a huge tourist draw for the county and there's usually something going on at the Roane State Expo Center. 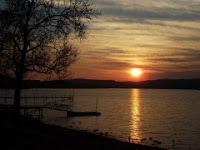 You can see how pretty the waterfront area is in the photos that I took. If I had known how nice it is in Kingston, I wouldn't have waited so long to go. OMG! That sunset is amazing. Where is this place?